Do you ever get lost in cyberspace? It's a hard thing to do, right? Last weekend, I was navigating my way through the MILLIONS of awesome creative sites on the Web and I came across this project. Of course, I lost my way and can't seem to find the exact site that I was visiting. Which means that I can't properly credit the amazing talent that shared her ideas with the world. So, in an effort to be fair, please know that I did not come up with this super exciting plan on my own. But, I am tweaking it to put my personal spin on it. Felt topiaries! Not only are they simple to make, they look chic. What a great way to dress up a mantel or sofa table! I don't think it looks campy or cr*fty. Cut approximately 80 3" circles from the felt - an equal number of each color. Fold the circles in half, then in half again. Secure to the styrofoam ball with straight pins. Fill in around the ball until you have a fullness that looks nice to you. 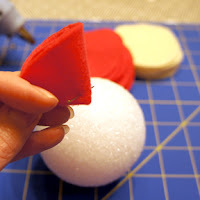 Take one dowel and insert through the entire width of your second ball. There is no magic method for this that I could figure out. I started a hole with a pencil and worked the dowel through. Try to keep your hole as straight as you can make it. 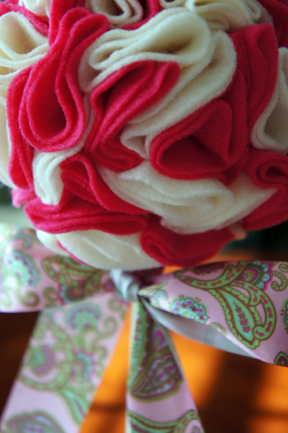 Insert the other end of the dowel into your felted ball. Push it to the depth that you like for the height of your topiary. 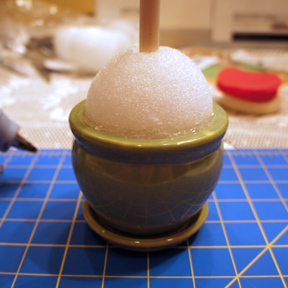 Secure the bottom styrofoam ball to your pot with a bead of hot glue. 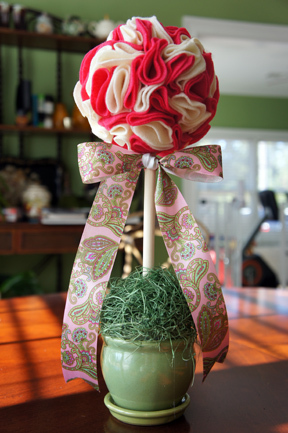 Cover the exposed styrofoam ball with decorative moss and tie a pretty ribbon on the dowel. You're done! Isn't it pretty? By the way, I HATED working with the decorative grass that I purchased. It made a terrible mess. 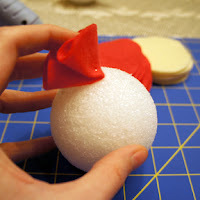 I have another idea for that step of the project and enough supplies to make two more topiaries. I'll share my idea in a future post (if it works out!). There is no update on the rug this week. I made another run to locate some additional jeans. Someone must have shared the secret about my awesome finds at Goodwill because when I went today, there was very little to pick from. I did find this crazy pair with a tiger running up the leg. That will make a nice addition! "Cr*fty Sunday" is taking place tomorrow at a friend's house. Tomorrow's post will be all about the project that we'll be tackling. I believe that Manhattans are involved in the festivities... genius!